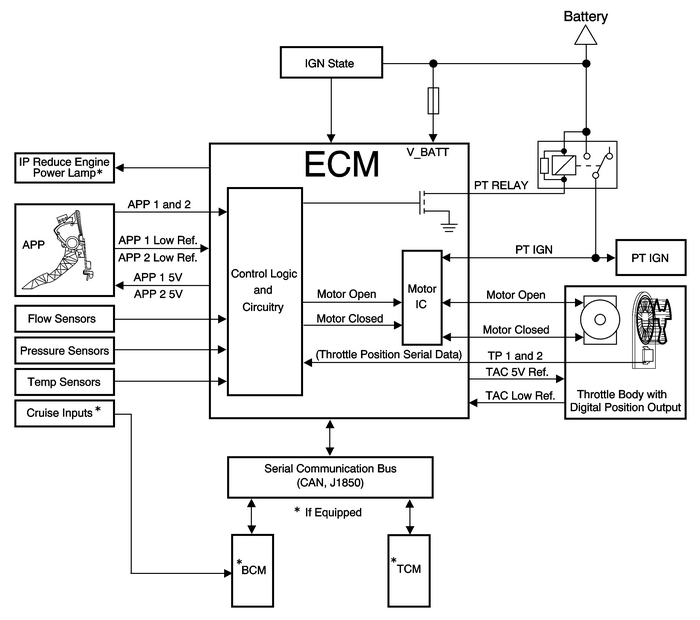 The engine control module (ECM) is the control center for the throttle actuator control(TAC) system. The ECM determines the driver's intent based on input from the acceleratorpedal position sensors, then calculates the appropriate throttle response based onthe throttle position sensors. The ECM achieves throttle positioning by providinga pulse width modulated voltage to the throttle actuator motor. The throttle bladeis spring loadedin both directions, and the default position is slightly open. Minimum pedal value—At key-up, the ECM updates the learned minimum pedal value.Minimum throttle position values—At key-up, the ECM updates the learned minimum throttleposition value. In order to learn the minimum throttle position value, the throttleblade is moved to the Closed position.Ice break mode—If the throttle blade is not able to reach a predetermined minimumthrottle position, the ice break mode is entered. During the ice break mode, the ECMcommands the maximum pulse width several times to the throttle actuator motor in theclosing direction.Battery saver mode—After a predetermined time without engine speed, the ECM commandsthe battery saver mode. During the battery saver mode, the TAC module removes thevoltage from the motor control circuits, which removes the current draw used to maintainthe idle position and allows the throttle to return to the spring loaded default position. Acceleration limiting—The ECM will continue to use the accelerator pedal for throttlecontrol, however, the vehicle acceleration is limited.Limited throttle mode—The ECM will continue to use the accelerator pedal for throttlecontrol, however, the maximum throttle opening is limited.Throttle default mode—The ECM will turn OFF the throttle actuator motor, and the throttlewill return to the spring loaded default position.Forced idle mode—The ECM will perform the following actions:Limit engine speed to the idle positionIgnore the accelerator pedal input.Engine shutdown mode—The ECM will disable fuel and de-energize the throttle actuator.